Richland, WA, Sept. 25, 2018 (GLOBE NEWSWIRE) -- Vivos Inc. (OTC: RDGL), a pharmaceutical company in the process of researching and developing minimally invasive treatments to combat cancer in humans and animals, today announced that it has retained well-known microcap analyst and consultant, George Sharp, as an advisor to the company. Mr. Sharp will advise Vivos on its business strategy, financing endeavors and its commitment to investor interests. "I am thrilled for the opportunity to work with Vivos’ management and I am encouraged by their dedication to create a valuable company that can improve therapeutic results and quality of life for those needing treatment and reward investors for their support of this important effort. This is a genuine commitment rarely found within the OTC Markets”, stated George Sharp. "I look forward to making my small contribution towards finding less invasive treatments for cancer through my continued support of the company." Vivos, Inc. has developed an Yttrium-90 based brachytherapy injectable device, for the treatment of tumors in animals (IsoPet®) and in humans (Radiogel™). Brachytherapy uses highly localized radiation to destroy cancerous tumors by placing a radioactive isotope directly inside the treatment area using the company’s proprietary hydrogel formulation. The injection delivers therapeutic radiation from within the tumor without the entrance skin dose and associated side effects of treatment that characterize external-beam radiation therapy. This feature allows safe delivery of higher doses needed for treating both non-resectable and radiation-resistant cancers. IsoPet® for treating animals uses the same technology as RadioGelTM for treating humans. The Food and Drug Administration advised using different product names in order to avoid confusion and cross-use. Drawing from his experiences as a litigant, investigator and forensic researcher, George Sharp consults with attorneys and publicly-traded companies seeking to protect investors. He has appeared on television and referenced in the print media for his efforts to combat microcap fraud. 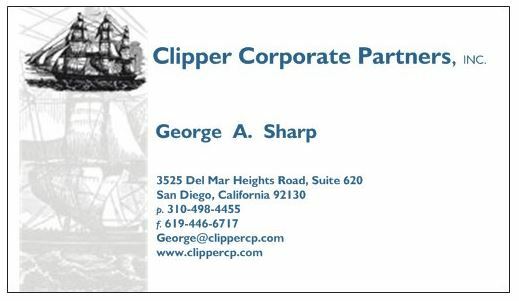 To learn more about George Sharp's services, visit www.clippercp.com.